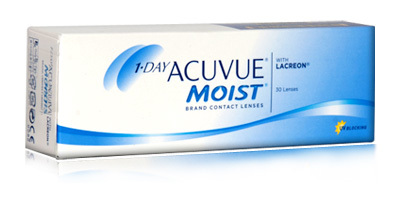 Every day you can get the fresh feel with the 1 day Acuvue moist 30 pack lenses. These contact lenses from Johnson and Johnson promise you ultimate comfort from the beginning of your day to its end. 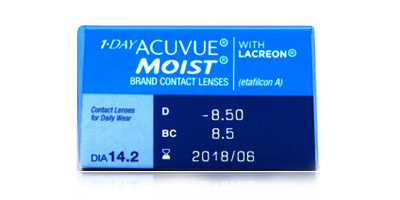 The 1 day Acuvue moist 30 pack comes with LACREON technology, which ensures each lens has a moisture rich component, promising all day comfort to your eyes. The signature Acuvue inside-out mark and visibility tint are also found in these lenses. 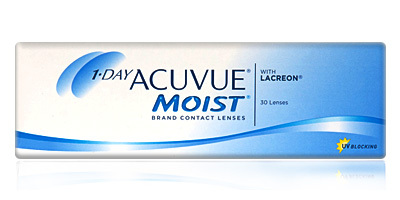 Contact lens wearers who suffer from discomfort, allergies and irritations with other contact lenses can find respite in these 1 day Acuvue moist 30 pack contact lenses. You get high levels of UV protection; relief from sore, dry eyes; freedom from lens deposits and solutions; convenience and frictionless comfort when you buy the 1 day Acuvue moist 30 pack. We are a trusted supplier of all Acuvue products. We provide you with factory fresh lenses along with manufacturer’s warranty. We ensure high quality products, outstanding service, efficient customer service and exceptional value to all our customers.